What an exciting time of year for those of us who love to garden! Leafing through catalogs and planning for spring reinvigorates the dormant grower inside. 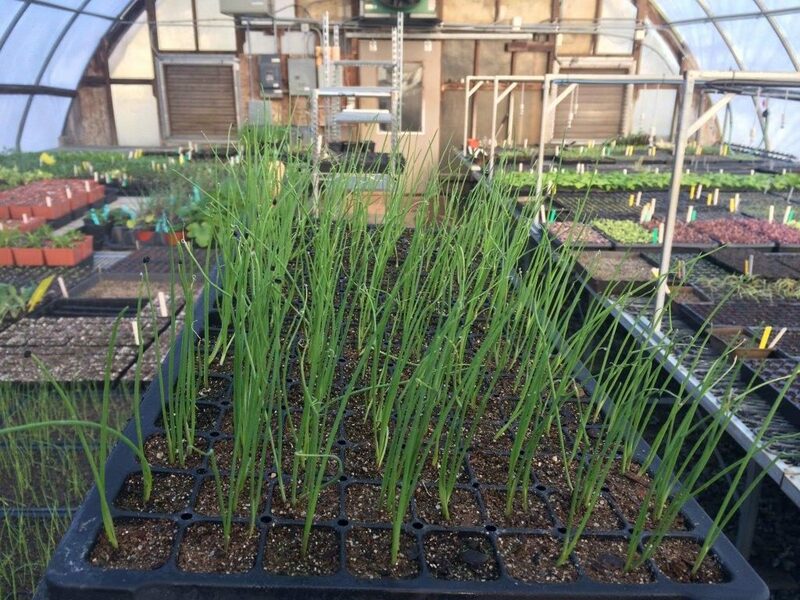 At Tufton Farm, we’ve been seeding in our greenhouse and taking pause to admire the garlic planted last fall. The vegetables we’ve planted so far include Onions, Leeks, Kale, Collards, Broccoli, Parsley, Sugar Peas, and Fennel. Not bad for mid-March! While a greenhouse is a luxury for many, a well-positioned window in your home will serve perfectly for early indoor planting while we wait for the frosts to leave once and for all. Potting soil that promotes good drainage. Try a mix that includes coarse perlite, vermiculite, or sand. To plant, fill your container with potting soil and very lightly compress the soil until you have approximately ¼ inch of space from the lip of the container. Take a handful of the onion seed and sprinkle over the surface of the container. Don’t worry too much about the spacing or amount of seed — onion seedlings don’t mind being close together. Most seed packets contain 40-50 seeds, which will plant well in a 2-inch pot. Thoroughly moisten the soil and place in your desired location. Be sure to keep the soil wet to the touch, but avoid flooding/standing water. And that’s that! Delicious onions arriving to your favorite summer recipe soon. Happy growing!